The Pro Arte Sablene W14 Brush Set includes five round and a one stroke brush from the Sablene brush range. This range of brushes offer a fully synthetic, cruelty-free alternative to natural sable hair and mark a new leap in synthetic technology. 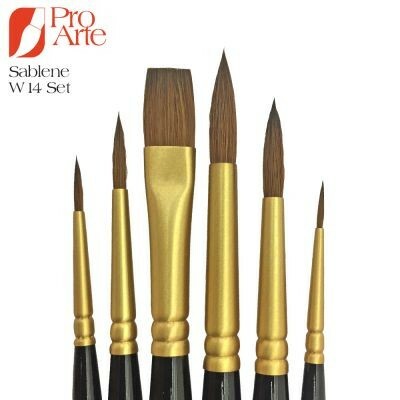 The Sablene range of brushes have polished black handles and beautifully gold finished ferrules. Sablene brushes are made with the very latest in synthetic technology and their hairs feature twists, turns and scales that mean they are able to mimic the qualities of a traditional sable brush. This set features a good range of sizes and shapes and would make a great starter set for anyone looking to try out this revolutionary brush.